This box set contains three color stat cards and one multi-part titan heavy warbeast plastic model (PIP 74057). Included are all the components to assemble one of three titan heavy warbeast variants: Cannoneer, Gladiator, or Sentry Titan. 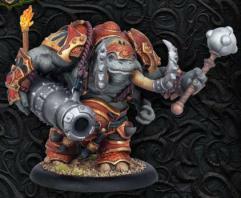 A player may field any number of these heavy warbeasts in a Skorne army.